The African Chicken Genetic Gains (ACGG) project conducted a baseline survey in 2015-2016 across ACGG countries (Ethiopia, Nigeria and Tanzania) to understand, define and characterize the current smallholder chicken production system, chicken ecotypes, current productivity, husbandry practices, farmer production objectives and socio-economic status of smallholder chicken keepers. This post introduces the Ethiopia baseline report. A small-scale poultry farm in Ada pilot learning District, Ethiopia (photo credit: ILRI). In Ethiopia, chickens are considered valuable assets for smallholder farmers and make an important contribution to food security, poverty alleviation and the promotion of gender equality within the household. 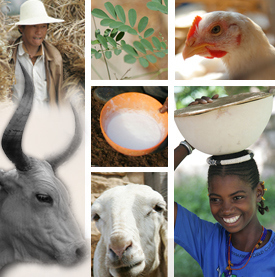 They provide meat and eggs, and generate income (from sales of birds and derived products). 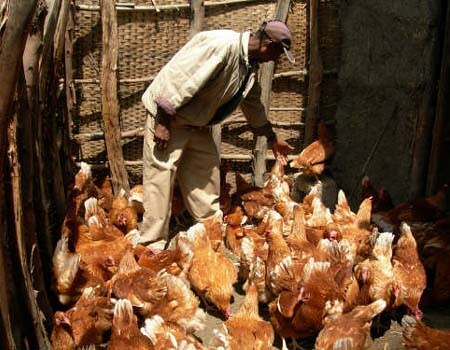 But there are many constraints to the development of the smallholder chicken production in improving productivity and overall livelihoods of rural and peri-urban smallholder households in the country. ACGG is implemented in selected villages of rural and peri-urban subnational zones of the regional states of Tigray, Amhara, Oromia and Southern Nations, Nationalities and Peoples’ Region (SNNPR), and in the Addis Ababa city administration region. The project conducted a baseline study at the start of the project. The baseline information was also used to inform the chicken strain choices for the project and implementation of the on-farm experimental testing. The cross-sectional baseline study covered a total of 1,257 households. Following a description of the survey design and tools, the study presents the main findings in the form of cross tabulation, rank-index, tables, and graphs. Only 252 (20%) of the sampled households were female-headed. The average number of years of schooling, family size and age of the household head was 3.1, 5.5, and 45.1, respectively. The mean chicken flock size per household was nine (9) chickens – dominated by hens, followed by chicks. Households with experience of providing supplementary feeding (i.e. any feed that was not scavenged) to their chicken at any time of the year were 94.3%. Sixty-one per cent (61%) of households preferred exotic breeds over other breeds. Good physical appearance, large body size, and weight for meat production and feed efficiency were the most important traits in choosing good cockerels. For good hens, production of more eggs was the most important trait. Chicken were kept for multiple purposes with egg consumption, egg sale, and live adult chicken sale rated highest. The average quarterly household income was lowest in Tigray (ETB 2,011.2 around USD 73) and highest in Oromia subnational zone (ETB 6,795.1). The average quarterly income of households from all sources was found to be about ETB 640. Poultry income accounted for 29.5% of total household income. Crop farming was their major source of livelihood for 82.1 % of households; livestock keeping was second; poultry keeping third. Chickens were owned by males or females or jointly, but the most common livestock ownership pattern is joint ownership. Livestock amounts to 38.5% of households assets on average. Respondents reported that they had enough food in the last 12 months (96% in Addis Ababa; 92% in Amhara; 87% in Tigray, 81% in Oromia and 79% in SNNPR). Overall, 85% of the sample respondents reported that they had adequate food in the last 12 months for their household. Most households have acceptable Food Consumption Scores (FCS) of more than 35. The dietary diversity score was found to be higher for children than for men and women. Chicken consumption was highest in Oromia (2.4 birds per household per quarter) and lowest in SNNPR subnational zones (1.1 birds per household per quarter). Tigray was the second highest bird consumption zone (2.2 birds). The general average across the subnational zones shows households consumed on average 1.8 live birds per quarter. Egg consumption was high in Addis Ababa (42 eggs per quarter) and low in Amhara (13 eggs) and SNPPR subnational zones. The average egg consumption across zones was 22 eggs per 3 months. On average, adult women spent 90 minutes a week on chicken-related activities. Children (at 45 minutes per week) spent more time than adult males and hired labour. Households sell their chickens (76% reported) to get money for covering household basic needs. The information generated from the baseline survey informed the design and implementation of the longitudinal (on-farm) study. It is also hoped that the information generated in the report can support future chicken research and development activities. In addition, the procedures followed and the baseline tools developed can be adapted for similar purposes outside ACGG subnational areas. Finally, the data provides a useful reference to study similar cases. Tags: baseline, baseline data, baseline study. Bookmark the permalink.